EXIT 9 percussion group is a leading ensemble in the contemporary music scene, tapping diverse expertise to create a fresh, unconventional sound. Whether performing ragtime xylophone, steel pan calypso, West African drumming, or premiering exciting newly commissioned works, EXIT 9 is devoted to performing invigorating and innovative percussion works. 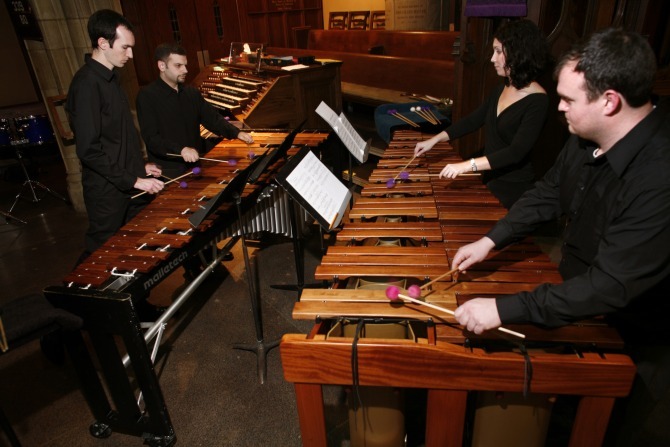 The third movement of Debussy's G Minor String quartet, transcribed for marimba quartet by Dr. Kevin Romanski and performed by the Exit 9 Percussion Group. Composer/percussionist 'Tigger' Benford's rhythmic, lively, and elusive sojourn into Balkan melody.